If you’re thinking of remodeling your home, you might be interested in finding out what other homeowners feel about home improvement. If you are thinking about home decorating or other home improvements, these 15 highlights from the 2014 Houzz Decorating Survey should interest you. 1. Many homeowners feel they are halfway towards attaining their dream home. In fact only 2 percent of homeowners believe they have achieved their vision. What’s more is that many homeowners are opting to overhaul existing décor instead of just refreshing. 2. The decision to decorate a home is driven by two main factors, namely, personal style and comfort. Trendiness does have some influence, but is low on the priority list. An interesting thing to note is that men are more likely to be influenced by trends than women. 3. Younger homeowners are making more bold decisions as far as color schemes and wallpapers are concerned. If you’re a young homeowner thinking of splashing on color, you’re in good company. 4. Many people are okay with just having paint on their walls. However, according to this survey, one in five homeowners have art covering their walls. 5. 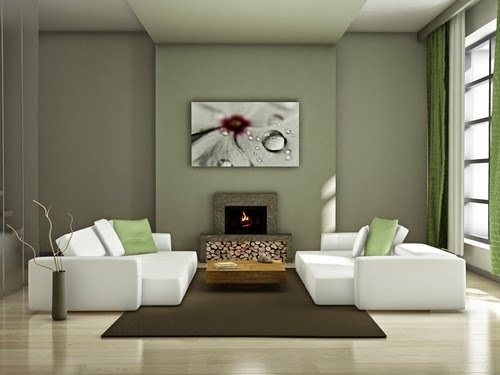 When it comes to accent walls, there are most popular among the urban population. And where accent walls are found, they are more likely to be restricted to the study/home office. 6. In matters fabric, solids are leading in preference. Other classics such as floral pieces and stripes follow closely behind. 7. Hardwood remains the most popular choice throughout the home. However, 38 percent of homeowners have plans to cover their master bedroom hardwood floors with carpet. 9. Turning your master bedroom into a living room is a thing now, with 60 percent of master bedrooms being equipped with seating, 8 percent with a fireplace and 8 percent with a fridge. 10. Surprisingly, three quarters of homeowners intend to use their dining rooms weekly, with rectangle tables and seating for six being the most common arrangement. 11. 16 percent of homeowners intend to have a TV in the dining room while 52 percent have it in the master bedroom. 12. And speaking of TVs, many homes are finding it fit to have TVs in their kids’ rooms. 13. As far as hiring people to do the decorating project goes, more homeowners are opting to hire someone to do the entire project, as opposed to 12 percent of homeowners who are hiring for e-decorating help. 14. 32 percent of homeowners hired professional interior designers for a few hours of consultation, which says something about the hands-on approach of many homeowners towards decorating. 15. Many people are not content with how their homes look, and are taking steps towards attaining this vision. “We’re seeing a lot of homeowners and their decorators and architects enquire about adding decks, stair railings and other home improvements,” says Ihab Barrawi, President and CEO of BuyRailings.com. This is what home ownership is all about!